1. Retro genuine leather, leaving natural marks style. Elegant, breathable, soft and comforbable. 3. About the free gift TPU case, durable and flexible soft TPU material covers your Apple Watch side and edges perfectly. Even more, The case isSlim, lightweight, shiny, shock-proof and shatter-resistant. 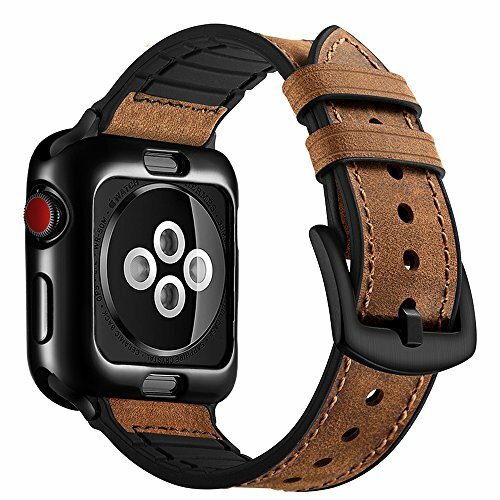 What You Get: 1 x 42mm Genuine Leather Brown Band + 1 x Free Gift 42mm Black Plated Soft TPU Protector iWatch Case. 18 months Warranty Guaranty after the date of purchase, unconditionally REFUND or REPLACEMENT with any quality problems, lifelong friendly customer service. Fit Wrist Size: Fits 6.5"-8.8" (165mm-225mm) wrists. Compatible with Apple Watch 42mm ALL Models, including: Apple Watch Series 3 / Series 2 / Series 1 / Edition / Nike+ / Sport / Hermes. Unique Design: The watch band's outer surface is made of high quality genuine leather and the back is nature black silicone rubber. It is a hybrid sweatproof strap, comfortablet and lightweight to wear. Security: Band comes with stainless steel connectors on both ends, which lock onto apple watch precisely. Durable soft TPU case cover protects all corners and sides of your iWatch. They are easy to install and remove. No tools are required.